In the mid-1980s, Chicagoans on their daily commute into the Loop were amazed at how quickly four new skyscrapers were rising out of the ground. 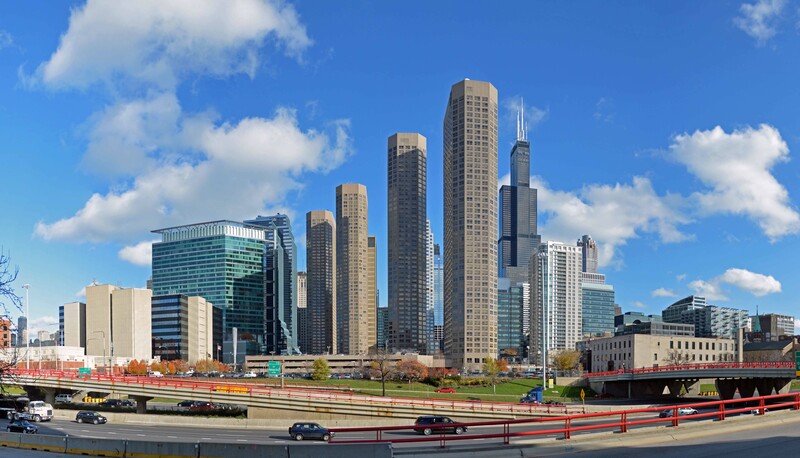 When they were completed in 1986, the four Presidential Towers (“PT”) high-rises (of six originally planned) became, until recently, the tallest buildings west of the river in Chicago. When construction began on PT, Chicago’s Near West Side was a picture-book of urban blight and decay. Madison Street was Skid Row and the area seemed a sea of parking lots and mostly derelict loft buildings. 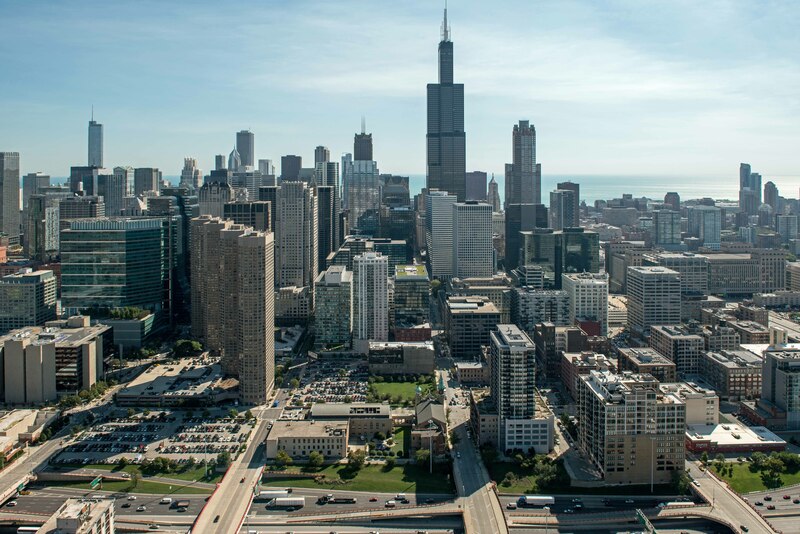 Presidential Towers ignited the area’s transformation into the neighborhood we now know as the West Loop. Some credit Oprah Winfrey for the West Loop’s growth, but it would be years before her Harpo Studios arrived on the scene. PT’s colorful past is unlikely to matter to renters drawn to the project by its close-in location, great views and extensive on-site amenities. 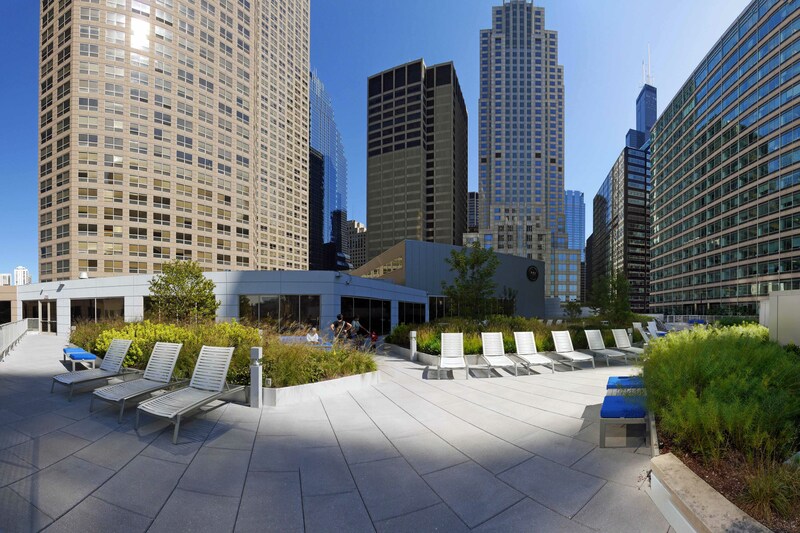 Presidential Towers is one of the largest apartment complexes in the Chicago area. Its four 49-story towers, designed by Solomon Cordwell Buenz, encompass 2,346 apartments, an array of commercial shops and extensive on-site amenities and services. You can see floor plans and check current rent levels and availabilities online. More than 1,400 of the property’s 2,346 apartments have been renovated, and the rest are scheduled for renovation. Changes include the replacement of carpeting with hardwood-like flooring in living areas, updated kitchens and baths, and opening kitchens to the living areas in some floor plans. The original floor plans were fairly spacious and included closet space that may make renters in newer buildings envious. Take a close look, for example, at the closets on both sides of the entry hall in the studio unit pictured above. None of the units have balconies or private outdoor space. Central heat and air-conditioning are included in the rent. Digital cable, HDTV and high-speed Internet access are available at additional cost. Free Wi-Fi is available in a number of on-site public areas. Views. The four towers are staggered on the site in a way that maximizes the views from every apartment. The site plan and angled bay windows result in many of the apartments enjoying outstanding views of Chicago’s skyline. PT’s size enables it to offer an extensive array of on-site amenities and services. A large landscaped sundeck was recently created in space that had previously been unused. 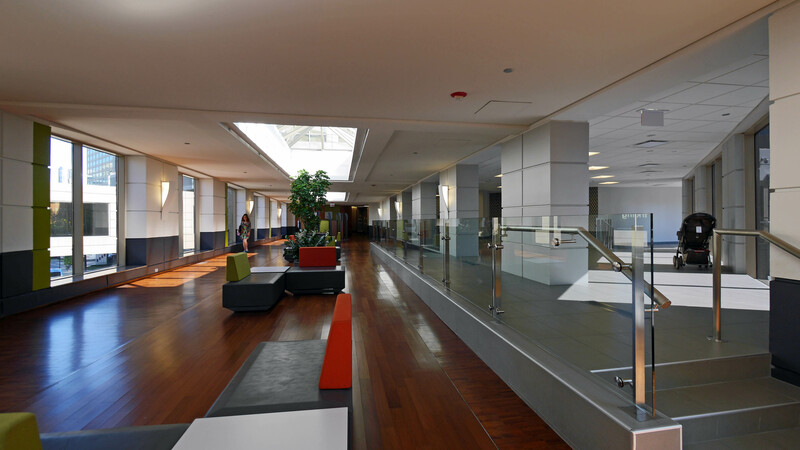 Interior concourses and individual building lobbies have been transformed. Different designers were chosen to create a unique look for each of the four tower lobbies. There’s a 52,000 square foot Fitness Formula Club at Presidential Towers. Cats and dogs are OK, subject to breed restrictions. On-site garage parking is available and parking is also readily available in nearby surface lots. Corporate Suites Netowrk offers daily, weekly and longer-term furnished studio, convertible, 1- and 2-bedroom rentals at PT. Some apartments include in-unit washers and dryers. The company has a 24-hour service desk and full-time housekeeping staff on-site. 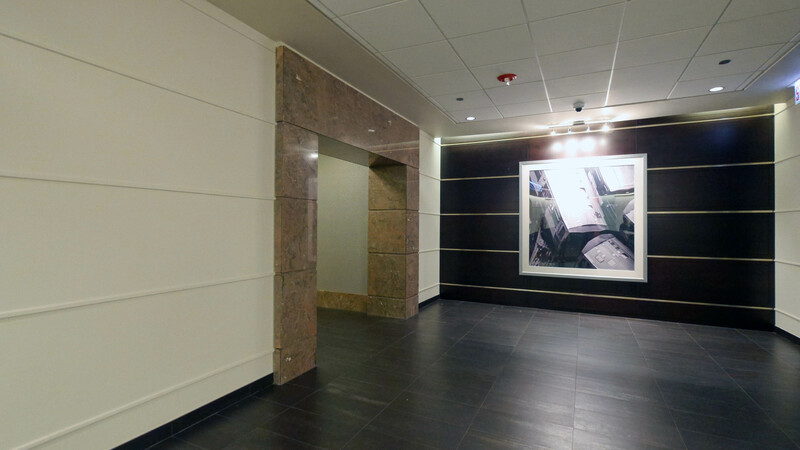 Presidential Towers is managed by Waterton Residential, which maintains an on-site office. An on-site leasing office is open daily from 9 to 6, Saturday from 10 to 5, and Sunday from 11 to 5. The complex has on-site maintenance and 24/7 door staff. Presidential Towers has a near-Loop location east of I-90/94. Shopping. Full-service Whole Foods and Mariano’s supermarkets are 3 blocks west, and Jewel is a few blocks north. The year-round indoor Chicago French Market is a 2-minute walk. Whole Foods, Target, Home Depot and other big-box stores along Roosevelt Road are a 5-minute drive. 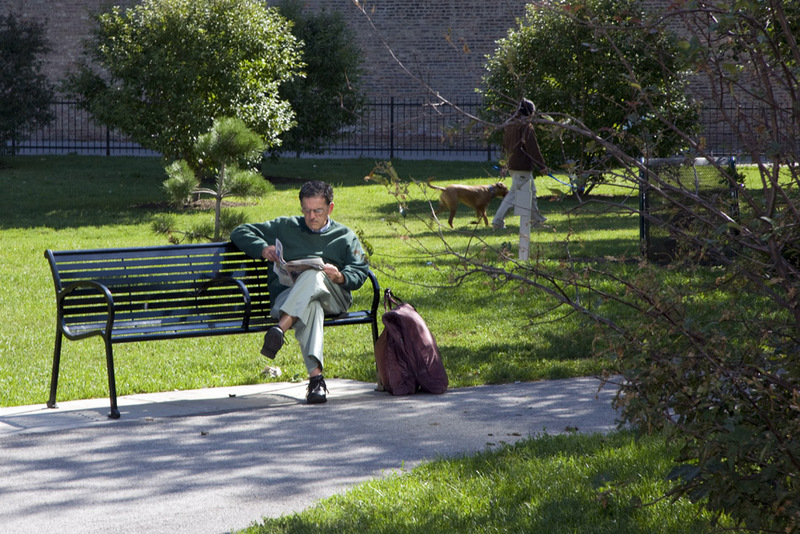 Heritage Green Park, a tranquil oasis and dog-walker’s destination, is almost across the street from PT. Old St Patrick’s Church, a Chicago landmark and home to what’s billed as the world’s largest block party, is within a block. Transportation. PT is a short distance from Metra’s Union and Ogilvie stations and Loop CTA stations. Expressway ramps two blocks west provide quick access to the Kennedy, Dan Ryan and Eisenhower Expressways. There’s frequent bus service along Madison St, and cabs are always plentiful. Zip cars and a rental car office are available on-site. 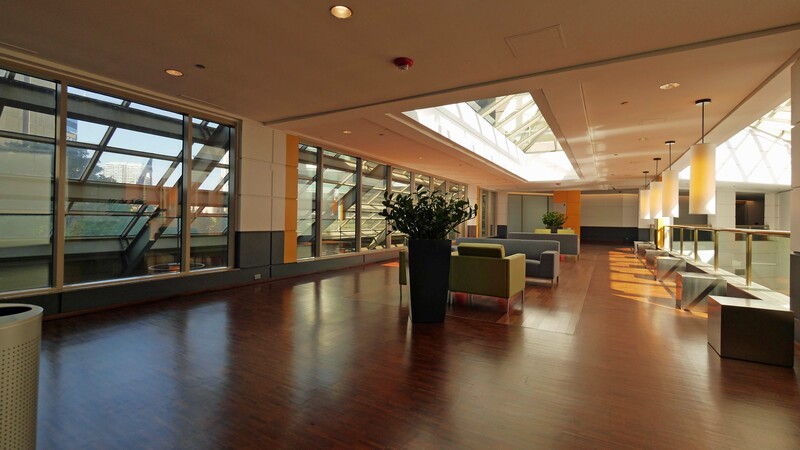 You’ll find additional options at YoChicago’s comprehensive West Loop apartment guide. If you’ve lived at or visited PT, add your thoughts in a comment. Comments are moderated, and commercial messages are not allowed. Parking On-site garage. Surface parking nearby. Heat and air are not included in the rent. Residents receive a separate bill for heat/air, gas, water, sewer, trash each month. It’s one of those communal bills, divided based on the square footage of the apartment. 2,652 apartments according to leasing agents last week, not 2,346. Each of the four towers has its own massive laundry room. There is not a central colorfully-named laundry room. 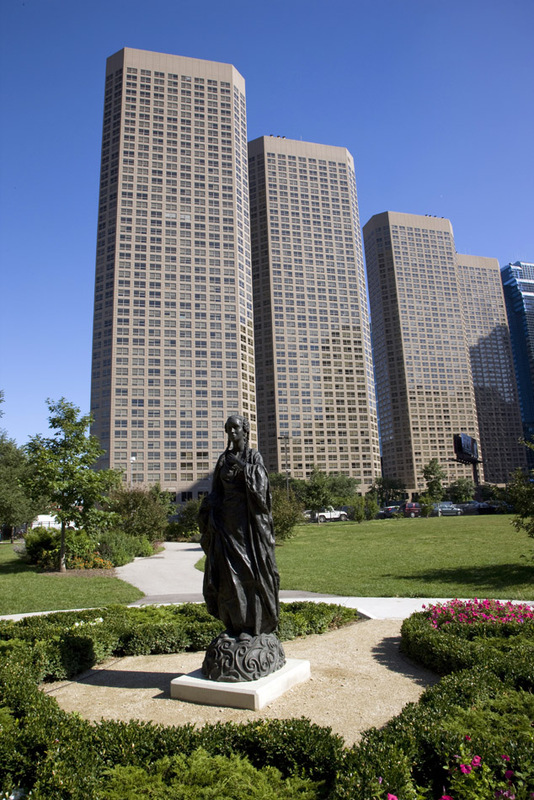 “of six originally planned”: , since to continue the line of Presidential Towers in either direction would mean demolishing Ogilvie Transportation Center, or Old Saint Patrick’s Church, neither of which are likely. Unless it was supposed to assume a boomerang shape and fill up that last surface parking lot before the highway. TV service is provided by RCN. Internet options are RCN, AT&T, or Clear. Not all studios have dishwashers, but those that don’t are at least cheaper than those that do. Regardless of what Old Saint Pat’s wants people to think, its drunken bash is not the “world’s largest block party.” It’s not even close. It’s not even the biggest church block party in the Midwest. That honor goes to the Basilica Block Party in Minneapolis, which is almost double the size of Saint Pat’s event. I think you misheard the leasing agents. PT has 2,346 apartments. I lived at ‘PT’ quite a while back, for four months; in fact it was the very first placed I ever lived in Chicago when I first transfered here after college; my corporate relo package paid my rent, and I had a furnished unit. This was back in 2004, and it was pretty bad, but based on the Yelp reviews it sounds like it’s gotten far, far worse. (And I tend to think all the negative reviews sound legit; the comments are pretty objective that would be easy to refute if they weren’t true, as opposed to more subjective comments). I actually gave feedback to the corporate relo provider, and I heard about a year later that they stopped recommending PT. should be more of a huge disclaimer, warning about this place. This is another example of where the rent they are asking is far higher than the value of the place; whereas if the rent was absolutely dirt-cheap, at least that would partially make up for the huge shortcomings, but for the rental rates they are quoting, someone can actually get a decent apartment somewhere else. I’ve been in many buildings in Chicago and around the country where I’ve had to sign in with a photo ID, even when accompaneid by someone who worked there. It’s obnoxious, but it’s a common practice in security-conscious buildings. …which sounds like you’re talking about an office building that is a workplace, not a residential building. Regardless… it just strikes me as extremely shady. And it really doesn’t sound like the people who moved in there were aware of this policy BEFORE they signed a lease; if they were aware of it before they signed the lease, they wouldn’t have as much room to complain (and I’m assuming PT would lose a lot of potential tenants as a result). Joe’s right. This is not uncommon. This has been the case in the last three buildings I lived in (two in Chicago, one out west), and I’ve visited people in other cities (mostly east coast) where this is also the case. My impression is that it stems from the size of the buildings. PT, for example, has more people living in it than most Midwestern towns. Keeping track of who’s going in is a good method of control and a crime deterrent, since you can only have so many doorstaff. The alternative is to have security patrols wandering the corridors like prison guards. I don’t think that would make the residents happy. If you don’t mind just anyone wandering around the place you live, then move into a two-flat. Tower living is not for you. If you’re the sort of person who feels offended by having your guests provide ID, then I probably don’t want you as a neighbor. As for all the PT complaints on Yelp, the majority of them were posted before the renovation project was begun by the new owners, or seem to be posted by very young people for whom Presidential Towers is their first experience in urban living. I saw nothing on Yelp that was unusual for any large city apartment complex. In fact, I’ve experienced a lot worse than what I saw posted there. Guests too quickly become permanent residents, and unofficial sublessees. The entire population of apartments can double or treble or completely turn over without a landlord’s knowledge unless some controls are in place. hmm, that’s sounds like a very perplexing comment to me. If I was visiting someone else who lived there, the impression I would get upon entering a place like this would be NOT be “wow this place is so safe and secure”, it would be: that the place has such major problems with tenants, and the main demographic that they rent to is so troublesome and low-class that they HAVE to do this. Really what that policy is saying is that it’s not enough for the tenant to vouch for their own guest, and that they don’t trust the very people that live there, at all. I don’t think you have much chance of being hired as head of security at PT – or any other large complex in Chicago, for that matter. At one condo building in Chicago a broker known to the doorman and I both had to surrender our drivers licenses before she was given the keys to her seller’s unit. These buildings have to deal with issues we can only imagine, and they have to adopt policies that are responsive to those issues. Real world, their options are limited. All of the high-class gated communities I know make you show your ID and check in if you’re a guest. It’s not a high vs. low class thing. It’s for security. Your example of being given the keys to someones elses unit sounds like a totally different scenario, and sounds reasonable. I have been to MANY residential high-rises in Chicago over the years (both rental and condo), and have NEVER been required to show an ID to enter. Even when the tenant is upstairs, at home, and the doorman calls up to get permission, I wasn’t, and definitely not ever when the tenant was actually with me. I think it’s fair to say it’s not the norm that a guest would be required to show an ID, especially when accompanied by the tenant that lives there. Given this, if they were being honest, the PT leasing guys would make this abundantly clear, to a potential tenant BEFORE they sign a lease; specifically spell out that their guests will not be able to enter the tenants own residence unless they have a photo ID on them. I agree, having to present an ID to enter a residential building is a bit over the top and I have never experienced this myself. An office building, yes. Joe’s scenario of checking out keys to look at a unit, yes. But to visit a tenant (while being escorted by the tenant) of the building, no. On a side note, I live near by and walk past this place when taking the dog out. The exterior proximity of the building ALWAYS smells like curry. If its smells like that outside, one can only imagine what the hallways or even your unit might smell like! I’ve noticed that strange smell when walking past it on Madison. It’s vaguely curry-like, but less appealing than most curries I’ve smelled. It’s definitely not coming from the Potbelly’s as they have their own smell. I had a coworker who lived in PT, but unfortunately she doesn’t work here anymore so I can’t ask what it smells like inside. That smelly exhaust area does provide some nice heat on the sidewalk during winter, though! I always appreciate that on my way to the Loop from the West Loop.